Leon Miles – second goal of the season proved a vital one. An injury time header by Leon Miles earned Khalsa an important three points after twice relinquishing a lead against a game and energetic Coventry United side who will feel – with some justification – they deserved at least a point. This was a game where the spectator got good value for money with the action pretty much relentless with both sides showing plenty of attacking intent. 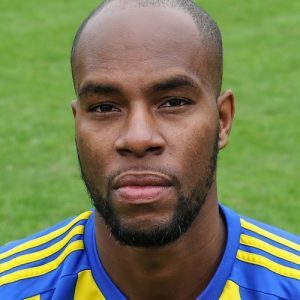 By the time Sean Williams headed Khalsa ahead on nine minutes from Mykel Beckley’s right wing cross, there had already been a number of half opportunities at both ends. Just a minute later, the game might have taken a different path had Daniel Dubidat’s looping header had gone in and doubled Khalsa’s lead rather than bounce off the woodwork to safety. As it was, United got back on level terms on 15 minutes. United midfielder Jack Holt – never shy about unleashing long range efforts all afternoon – appeared to control the ball with his hand, an offence that went unpunished, before he smashed a low one from distance that Sam Arnold was only able to get half a hand to it before it trickled in. Dave Meese forced United keeper Brendon Bunn into a reasonably routine save on 27 minutes and with four minutes on the clock Holt unleashed another fizzer that rattled the crossbar with Arnold beaten. The second half picked up where the first half finished. Remi Birch and Josh Thomas combined well for Khalsa on 50 minutes, Birch’s dangerous cross eluding everybody in the box and rolling to safety. Khalsa regained the lead on 64 minutes as a Liam Armstrong free kick found Miles whose header forced a good save from Bunn but fell to Dubidat whose powerful scissor kick made it 2-1 for his first Khalsa goal. United really stepped up a gear in the final quarter of the game and were a real handful for Khalsa, particularly down the flanks. Substitute Brad Caswell fired over from Dominic Alleyne on 67 minutes and on 75 minutes Arnold clawed away a shot by Gift Mussa from Joe Cairns’ pass. The pressure told on 77 minutes when substitute Tyler Haddow finished well after the Khalsa defence struggled to contain a right-wing break. Five minutes later and Haddow might have put the visitors ahead after being fed by Alleyne but pulled his shot wide of the near post. Miles’ header in the first minute of injury time was against the run of play at that point of the game but earned Khalsa a vital three points in the run-in. Sporting Khalsa: Sam Arnold, Remi Birch, Alex Melbourne, Leon Miles, Shawn Boothe (captain), Dave Meese, Sean Williams, Liam Armstrong, Danny Dubidat (Alex Perry), Mykel Beckley (Jay Holdcroft), Josh Thomas (Mensah Kinch). Subs not used: Kieron Whittaker, Carlo Franco.